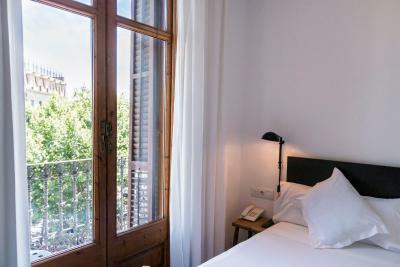 Lock in a great price for Som Nit Triomf – rated 8.3 by recent guests! 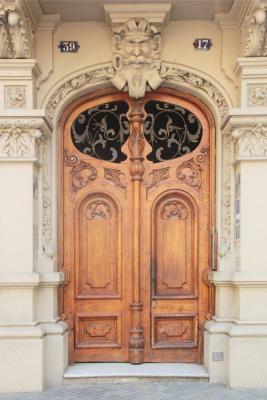 I met a staff member /receptionist at the front door who barred my way. I had to explain that I was a scheduled guest . He asked "here?" He became more accomodating after the check in was completed. The room was clean and somewhat bare. 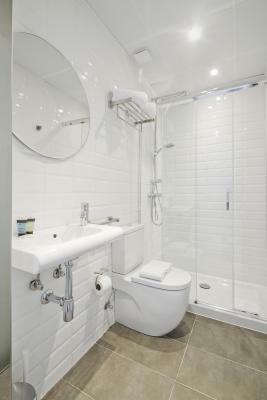 My bathroom was handicap accessible with one of the best showers in Europe. The room was quiet. There was no breakfast or coffee. 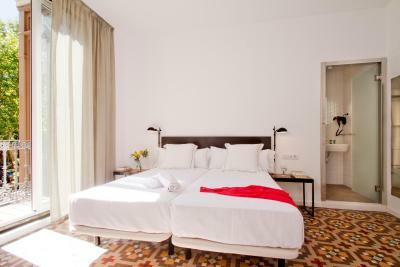 The rooms are very clean and beds are comfortable . The decoration is modern. It is close to many shoppings and restaurants. Staffs are very helpful. No fluffy eggs because breakfast not included! Easy to operate safe.Wonderful, sensible shower compared to typical 1/2 glass partition that floods the typical Spanish bathroom floor!Most of all, the kind,infinitely patient and helpful staff of inessa, Cecilia, Carlos, Vlad, and Rodrigo. Extra bonus:You Tube on tv. Good location. 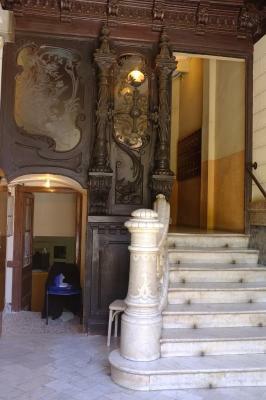 Accommodating cleaning crew.Beautiful , well preserved building. 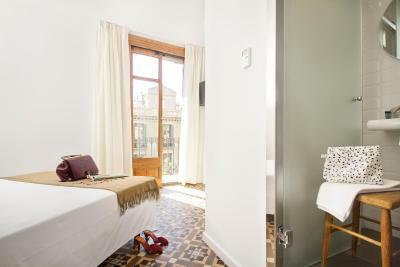 AC conditioners , the balcony , the location is great that you can reach all tourism area by walk. Oh yah . They have safe in the room . Excellent location and very, very friendly hostess. Pros: Location was great. Beds were very comfortable. 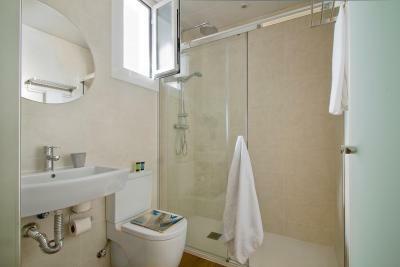 Room was very clean with new bathroom. Interaction with staff was minimal which was fine but helpful when we did ask them questions. 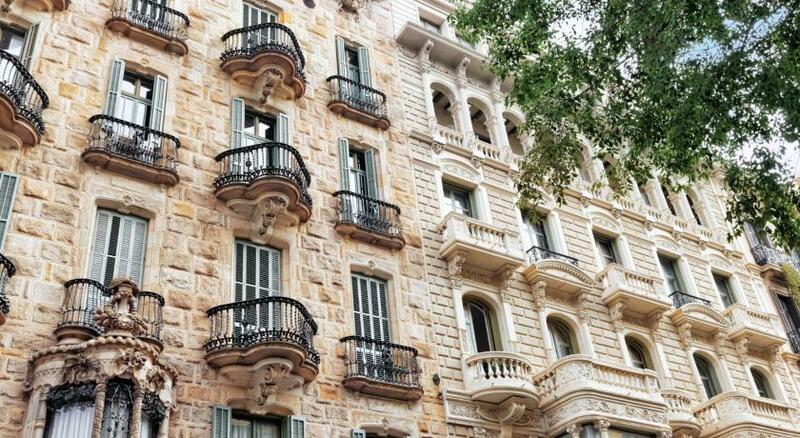 One of our best sellers in Barcelona! 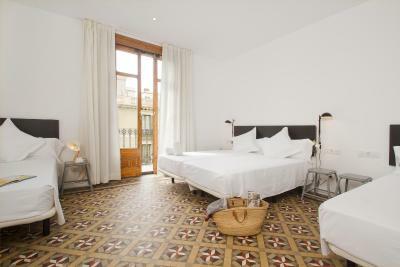 Centrally located, Som Nit Triomf features rooms with free WiFi and private bathroom. 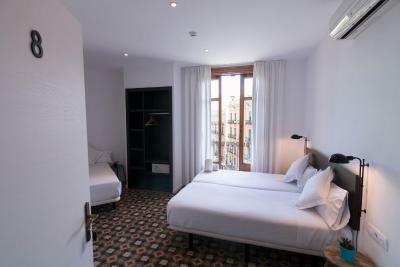 It is 2,650 feet from Ramblas and Plaza Catalunya as well as from Barcelona North Bus Station. 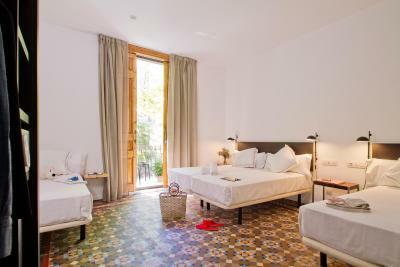 Rooms are fitted with traditional Catalan Modernist tiles and they all have a wardrobe. 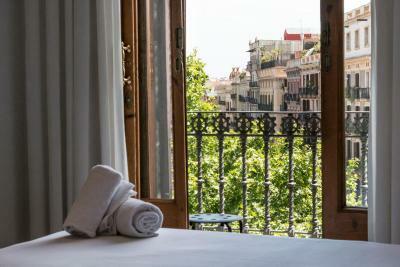 Some rooms have a balcony with city views. A kettle and ironing facilities are available on prior request at reception. There is a plenty of restaurants, shops and trendy bars in the surrounding area and a 24-hour supermarket can be found 650 feet away. 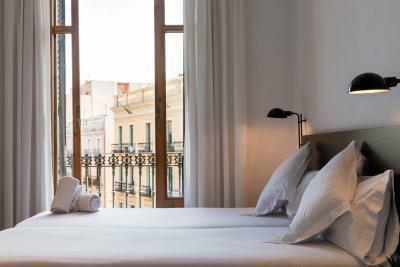 Som Nit Triomf is located between the Eixample and Borne District, 1,500 feet from Arc de Triomf and Urquinaona Metro Stations. 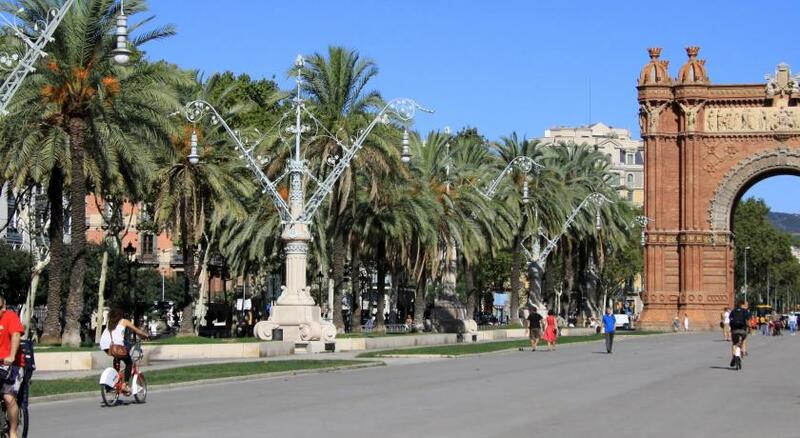 You can walk to fashionable Passeig de Gracia in 10 minutes and the tree-lined Passeig de Companys connected to Ciutadella Park is just 500 feet away. 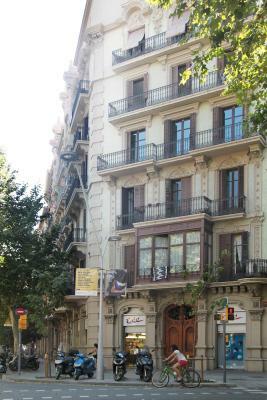 뀐 Located in the real heart of Barcelona, this property has an excellent location score of 9.0! 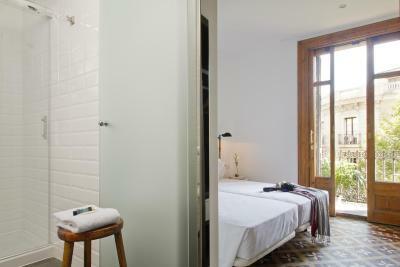 When would you like to stay at Som Nit Triomf? 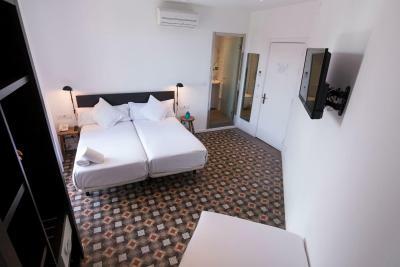 This air-conditioned room features free WiFi, a Smart TV with internet and a free safe. 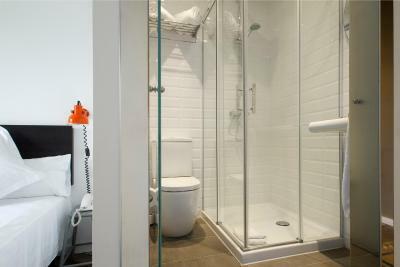 The private bathroom comes with a shower. 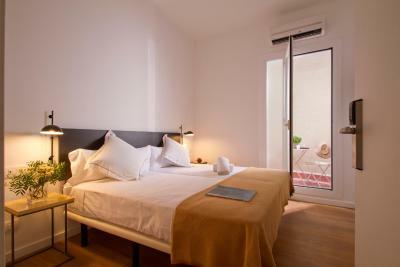 Bed linen, towels and a daily cleaning service are included. 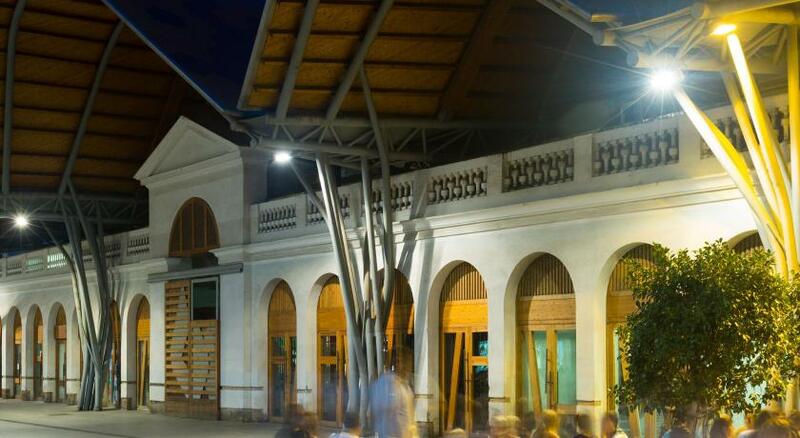 Private parking is available at a location nearby (reservation is needed) and costs EUR 37 per day. 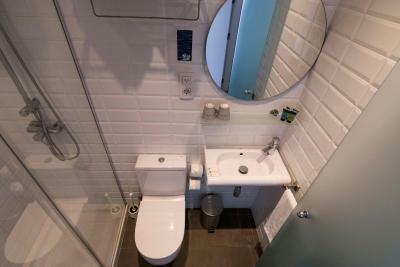 This air-conditioned room features free WiFi, a Smart TV with internet and a free safe. 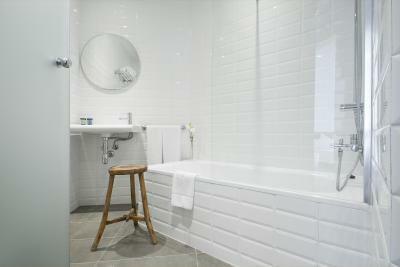 The private bathroom comes with a shower or a bath. 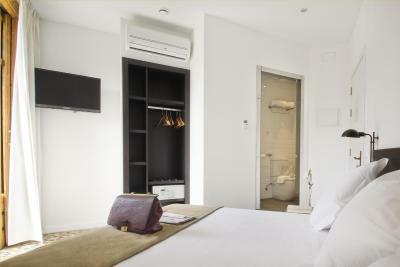 This air-conditioned room features free WiFi, a Smart TV with internet and a free safe. 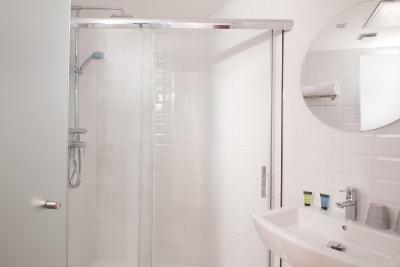 The private bathroom comes with a shower. 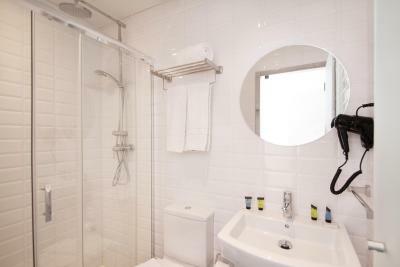 Bed linen, towels and a daily cleaning service are included. This room comes either with a balcony or a terrace. House Rules Som Nit Triomf takes special requests – add in the next step! 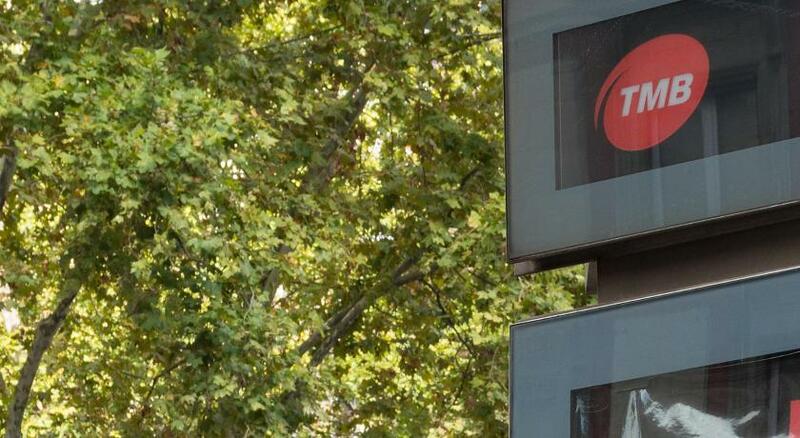 Som Nit Triomf accepts these cards and reserves the right to temporarily hold an amount prior to arrival. I think I got the smallest room on the floor. It was ok for me as I didn't have a lot of stuff, the only thing is I had some work to do on my laptop so would have helped if I was in a slightly bigger room with a desk but it was not too bad. I have seen this in a former review and agree a long mirror would have been a nice feature. But honestly for a brief 3 day stay, the overall experience was great! Location was pretty central and can walk to a lot of the attractions so its good value for money. Great neighborhood just active enough but not too busy with plenty of super markets, restaurants /cafes around (just across along Carrer de Trafalgar) there is an organic cafe called Buenaventura with a nice ambiance. Furthermore, the staff is super friendly and helpful. Ines had greeted me at check-in. I had arrived much earlier than the check in time from an overnight flight. Unfortunately there is not much of a common hall to hang around, but Ines was really cool she didn't rush my check-in allowing me time to lighten my bag pack before she took my luggage to storage. She recommended a cafe/bakery nearby that would allow me to sit back and wait for check in. 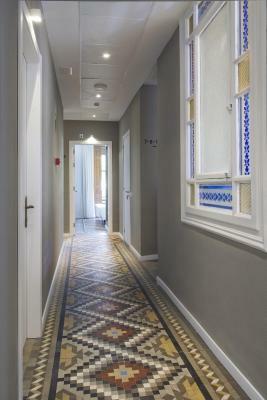 She was very thoughtful and ensured I could move in as early as the room as ready before the official check in time. Upon booking you also receive an email for a pickup service should you wish - great service/value for money, if you are arriving after an overnight flight or really late. I highly recommend it. 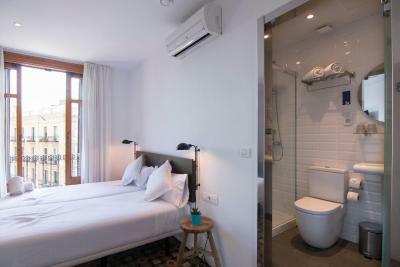 The room I got was small but efficient, very clean and modern looking. Access and security for the building is really good, simple and effective. 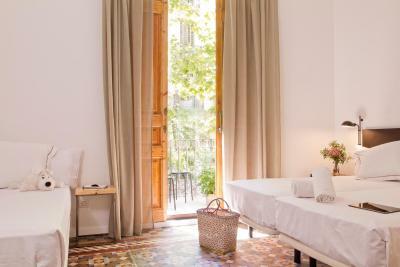 It was a beautiful room in a beautiful setting with extremely helpful staff. It also was handy that staff were on site 24/7 if ever you needed assistance. Loved the room! 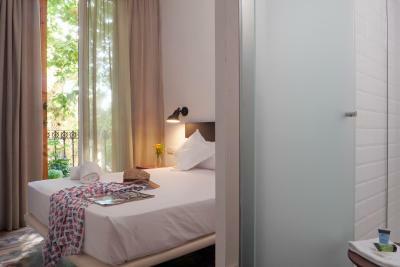 Everything was spotless, comfortable bed, spacious shower, attentive staff and great location ! Would definitely stay again ! The room was a little bit smaller for 4 people. The images showed in the reservation does not match with reality. Noisy guests at 4 am. Expensive small room next to reception. Bad sound insulation from neighboring apartments. No breakfast. My room was too small. The window opened to a wall. My room was literally next to the reception, so privacy-wise it wasn't that relaxing. The toilet seat was stained. Bathroom sink too shallow! 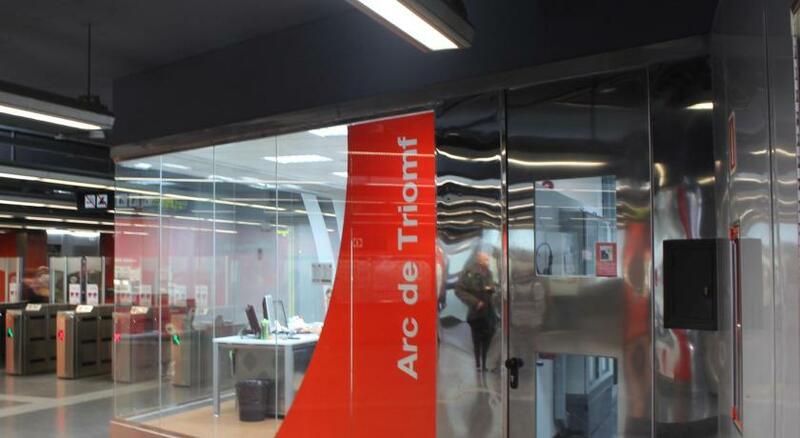 Som Nit Triomf is at an excellent location! 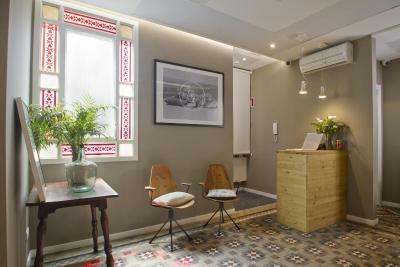 A value-for-money establishment housed on the 4rth floor of an old building. 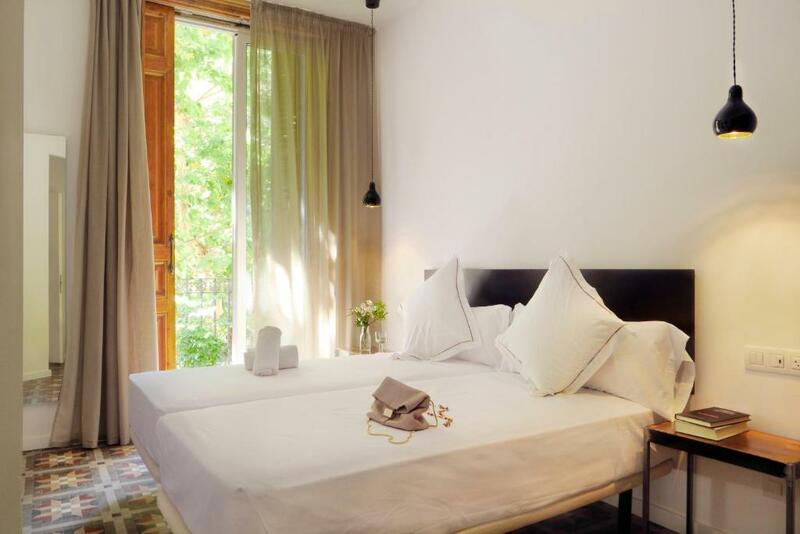 Interiors are modern and recently renovated, but overall feel is budget-conscious. 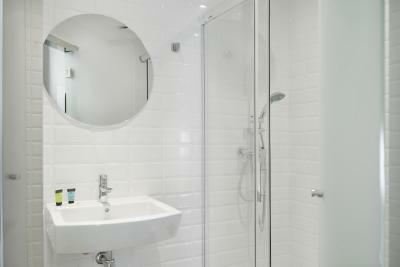 Daily cleaning and change of towels! Great wi-fi!